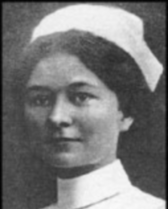 Helen Fairchild had a very short career as a nurse, but she became one of the most famous nurses in history because of her many letters describing combat nursing during World War I. Her down-to-earth letters made wartime nursing come alive in a way that has never been equaled. Helen was born in Milton, Pennsylvania on November 21, 1885. In 1913, she graduated from Pennsylvania Hospital with a degree in nursing. She had a history of indigestion and abdominal pain for many years but persevered with her work. When the United States entered World War I in 1917, Helen, along with 63 other Pennsylvania nurses, volunteered for the American Expeditionary Force that cared for wounded soldiers overseas. After a very rough eight-day passage by ship, the nurses arrived in Liverpool, England, in May 1917. In letters to her mother, Helen described the journey and the heavy, drab uniforms that they were required to wear at all times while in England. After a short time in England, the nurses were sent to the British Base Hospital No. 10 in France. It was later known as Pennsylvania Base Hospital No. 10 because it was staffed by the 64 Pennsylvania nurses. As soon as they arrived at the 2,000-bed hospital, they were deluged with a very large number of extremely ill soldiers who had been poisoned by mustard gas. Each day brought more newly wounded and poisoned soldiers. The nurses lived in unheated huts with few comforts. They worked 14-hour days and were given one-half day off a week. Fairchild praised the efforts of the Red Cross and the YMCA. She wrote that they would not be able to function without their supplies. In July, Helen was transferred from the base hospital to a casualty clearing area, closer to the front lines. When she went there, she only expected to stay a few days but ended up staying much longer. The living and nursing conditions were almost unbearable. She was on the operating team and waded through mud to get to the operating room. There, she and the other nurses stood in mud higher than their shoes. It was reported that the odor was terrible, and not only did the nurses pass instruments and sponges, but they inserted drains and closed wounds while the doctors went on to their next patients. The nurses lived in unheated tents and they had no linens for the beds. Helen wrote that she wore woolen clothing with two pairs of stockings and relied on hot water bottles to keep warm. The meals often were just tea, bread and jam. Night bombing of casualty area was frequent. The tents had iron sides and hinged sections of iron on the floors and the nurses dug shallow holes and covered themselves with the iron when they were being shelled. It was here that Helen was exposed to mustard gas that may have played a role in her final illness and death. There is an undocumented report that she gave her gas mask to a soldier. By October 1917, Helen was back at the base hospital. In November, she had tonsillitis from which she recovered, but after that, her stomach pain returned. She was ill enough to be off duty. The doctors tried medication and diet, but nothing seemed to improve her condition. Just after Christmas, she began vomiting all of her food, and a barium x-ray revealed that she had a large gastric ulcer that involved the pyloric valve. Surgery was performed on January 13, but she soon became jaundiced and died from acute liver failure on January 18, 1918, at the age of 32. The cause of death is listed as chloroform poisoning following a lengthy anesthesia, although there are those who think that mustard gas poisoning and poor working conditions might have been contributing factors. She is buried in France at the Somme American Cemetery and Memorial. Helen Fairchild was a dedicated young nurse who put the welfare of others above her own. She, as well as so many other nurses, endured severe hardships to care for the soldiers who were fighting for American freedom. Her many letters to her family document the conditions the nurses faced as they carried out their duties with grace and dignity. Her honest words elevated the status of military nurses everywhere. During her time in France, Helen wrote 100 pages of letters. Her niece, Nelle Fairchild Rote, collected the family letters, a selection of which was published in the November 1997 issue of the Daughters of the American Revolution Magazine.